Calling all screenwriters! Have a screenplay that you think could be the next big thing? Then submit it to Cinequest’s Screenwriting Competition and not only compete to win the $5,000 cash prize if you win best feature-length script, but also have your screenplay read by a panel of established industry professionals. In addition, there are also categories in Short and Teleplays, with the winners of each receiving a $1,000 cash prize. Interested parties can choose to submit their script today, October 17 and enter the code STUDENT15 to receive a $15 discount. You can submit your script here. In addition, there is an Extra Late deadline that closes November 7. Entrants must submit via WithoutABox and are unable to use the promo code. Cinequest creates global connectivity between screenwriters, filmmakers, and innovators. 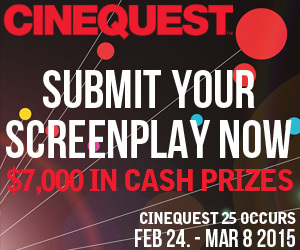 Cinequest welcomes writers of all genres for Features, Short-films, and Teleplays to submit for a chance at $7,000 in cash prizes and opportunity to be read by industry pros. The annual Writers Celebration in March 2015 features innovative writing forums and inspiring Maverick Spirit event honoring legends like Neil Gaiman, Chuck Palahniuk, and J.J. Abrams! For more info, visit Cinequest Screenwriting Competition.